Burgoyne Construction Ltd. is a General Contractor servicing the Stony Plain, Spruce Grove, and Parkland County Area. We specialize in exterior & interior Home Renovations. Quality You Deserve. Dependability You Can Count On ! As a siding Contractor here is a shop out of town that the owner calls us when he needs help with it. 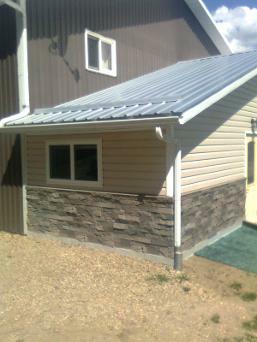 This time we supplied and installed the siding, soffit & fascia, faux stone and the capping. This was when we were about half way done of closing in the outside of the addition. We had the stone installed and starting to install the Vinyl Siding. Burgoyne Construction Ltd. is a Residential Construction Company based out of Stony Plain, Alberta. Being in such a competitive industry in a small town, Burgoyne Construction Ltd. as a General Contractor tries to do it's best to excel by being modern and up to date. Quality is our key to client satisfaction, offering the highest standards for Renovations, New Construction, Decks, Drywall, Mould and Rotten Wood Removal, Additions etc. We have been in business since 2007 and in Construction for over 35 years and looking to be in business for many years to come. Burgoyne Construction Ltd. of Parkland County started their business in Faux Stone, and has been building great customer relationships with our clients since 2007 . We have many customer call backs and referrals because of the wide range of construction experience that we have. Some of the projects from the past includes Decks, Siding Install, Siding Repair, Roofing to name a few. The owner has over 35 years experience in Residential, Commercial, and Industrial work, and this allows him to take on any job or reno that you may have in mind. Our continued commitment to the highest quality of workmanship keeps us ahead of our competition. Our subcontractors are the best at what they do, so we do a quality job the first time. Since we opened our business in 2007 we have grown by 1200 % to date and continue growing each year. We have a significant amount of experience in interior projects which includes basement renovations, laminate flooring, drywall repair and also exterior home renovations like Soffit, Fascia, or Repairs, Aluminum Railing, Doors and Windows. Our Picture Gallery will show you some of the examples of the projects that we have completed. There is also other construction issues and home renovations projects that we have done listed also. If you check out our Service page you will find a list of all the different services that we do. So if you have any questions about your next home project, please don't hesitate to give us a call @ 780 - 915 - 5611. So if you live in Stony Plain, Spruce Grove, Parkland County, Tomahawk, Drayton Valley, Edmonton, Onoway, St. Albert, Devon, Mayerthorpe and Whitecourt just to name a few places, please don't hesitate to give us a call. So if you're looking for anything from Faux Stone to an Addition please call, so we can be your Home Renovations Company @ 780 - 915 - 5611 or email us @ burgoyneconstructionltd@live.ca.